In this interview, author and collector Mark Bahti shares his lifelong appreciation for the artistry of Southwest Native American jewelry. Bahti has written numerous books on Native American culture and crafts, and he’s the proprietor of Bahti Indian Arts based in Arizona and New Mexico. This bear bracelet by Navajo silversmith Robert Sorrell features a stunning slab of spiderweb turquoise from Arizona’s Gold Canyon Mine. Thanks to my father, I basically grew up involved with Indian arts and culture. He was a graduate of the University of New Mexico and wrote the first popular book on Southwest Indian arts and crafts. In the summer of 1949, he opened a little shop called Ghost Ranch Trading Post at Ghost Ranch in Abiquiu, New Mexico. That winter, he moved the shop to Tucson, Arizona. I started doing some of the buying for the shop when I was 16 and took over the store in ’72, shortly after I turned 21. I still run the shop in Tucson; we opened another one in Santa Fe about four years ago. 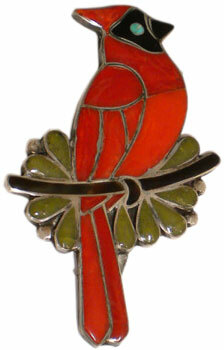 Our primary focus is on contemporary Southwest Indian arts and crafts. We carry a little Northwest, as well as older items, but over the years we’ve been focusing more on contemporary objects. We only handle older pieces when there’s very good provenance on them. I appreciate different crafts for different reasons. I really enjoy basketry because I know the amount of time involved in learning it and then doing it. And I endlessly admire the dedication of the weavers who keep their craft alive and evolving. It really is a very serious dedication that goes beyond just a source of income. Each craft has got something that holds a personal interest for me—the Hopi kachina dolls, Zuni fetishes, the pottery, all of it. I’ve always admired jewelry, whether it’s old or new, because I’m intrigued with the techniques involved and the different ways people approach the same kind of construction issues. There’s never just one way to make something. In the final piece, you can sort of see the fingerprints of how the artist worked on it, particularly with older jewelry. I find that very interesting. Collectors Weekly: When did silversmithing come to the Southwest? Bahti: The Spanish introduced it early on, but it didn’t begin to take hold among the tribes in the Southwest until the late 1860s, early 1870s. Among the earliest artists, the one best known nowadays is Atsidi Sani, who was, as far as we know, the first Navajo to work silver. Silversmithing seems to have slowly spread through families, which would make sense. If you have a valuable skill, you’re going to want it to pass it on to people within your extended family, people who are part of your community who will support you and your extended community. You’re not going to pass on the craft to people who will become your competitors. When the railroads started bringing tourists and visitors out west, the companies that ran the gift shops and so forth needed more jewelry than was being produced, so they began paying silversmiths to teach other silversmiths the techniques. The number of silversmiths grew exponentially. There was a whole new, very large market for their work. It wasn’t just a regional market anymore. Collectors Weekly: What are some of the most important tribes for the early jewelry? Bahti: The Navajo were, and still are, the tribe with the greatest number of silversmiths, not just because they were first but also because they’re the largest. In terms of silver jewelry, the primary ones are still the Navajo, Hopi, and Zuni, although there probably isn’t a single tribe in the Southwest that doesn’t have at least a couple of silversmiths. A trio of bracelets: The one on the left is circa 1930 and features turquoise that’s probably from the Pilot Mountain Mine in Nevada. The center bracelet is probably from the 1950s and is set with matched, natural-nugget turquoise from the Burnham Mine, also in Nevada. The bracelet at right is from the 1920s to 1930s and boasts numerous spiderweb stones. In the very beginning, the tribes that made silver all worked in essentially the same style. Starting in the 1930s, there began to be some distinctions between the styles of the tribes, which lasted until the end of the ’40s. Notably, the Zuni started to become known for their lapidary work, which included cluster pieces and various forms of mosaic and inlay. The Hopi, as part of a project initiated by the Museum of Northern Arizona, began developing overlay work. And the Indians of Santo Domingo Pueblo, now called Kewa, continued to be best known for their stone and shell beadwork and mosaics. Collectors Weekly: What materials were used in early Southwest Native American jewelry? Bahti: In prehistoric times it was basically shell, stone, and antler. With the coming of the Spanish, metal was introduced, almost half of which was silver. You see a little brass and copper, but not very much. That didn’t change much until the 20th century, when there were a few innovators like Charles Loloma, who began experimenting with new types of stones and shells. He also began using gold on a regular basis. People in the past had used it occasionally for a special order or an accent, but that was pretty rare. As people like Loloma opened up the door to experimentation, change just exploded in the ’70s. There was a tremendous amount of innovation going on, new tools, new materials, and new techniques. People were beginning to use reticulation, lost-wax casting, and various new techniques in hammering, raising, and shaping metal. Collectors Weekly: What is the origin of the Navajo squash-blossom necklace? Bahti: The squash blossom is interesting because it’s a good example of why “traditional” isn’t really a useful term. Basically, the squash blossom made use of a foreign technology: silver work. It involved combining a design from another continent—a pomegranate blossom—with the little horseshoe-shaped pendant that the Navajo call a nazha, which was actually introduced to Spain by the Moors. The squash blossom combined all three of those things and created something that very distinctly fit a Navajo aesthetic. This prewar link belt has stampwork Thunderbird images. A short belt, it is just over 33 inches long and each concha is 1.75 inches across. In the 1870s, when it first came out, the squash blossom would have been regarded as very innovative, but now it’s viewed as one of the most traditional Indian jewelry forms. But really, “traditional” only describes it at one point in time. When it was first developed, it wasn’t traditional, of course. Collectors Weekly: What are some other examples of Southwest Native American necklaces from the 20th century? Bahti: There were squash blossoms with both tribal and individual artist variations; necklaces of silver beads decorated in a variety of ways, depending on the artist; and then stone and shell necklaces sometimes with pendants or tabs added to them for decoration. Then, starting in the late ’30s or so, the Zunis began creating a fetish necklace made of shell or stone beads with little carved shell and stone animals strung on it. Collectors Weekly: Besides necklaces, what other pieces are prominent in Southwest jewelry? Bahti: Basically, the whole range of jewelry items—buckles, bracelets, rings, pendants—plus a couple of items that were unique to their cultures. For instance, the concha belt, which is a belt that has oval plates of silver strung on it and a buckle that may be the same shape as the conchas or maybe a little different shape. The style has evolved quite a bit. The very oldest ones had a slotted center, either diamond or oval, so that you could thread the leather through it. Today people make link belts that are small enough to string through the loops on your jeans. Another fairly unique item is the bow guard, which is used to protect the wrist against the snap of the bowstring. At one time, silver bridles were made. Now those are special orders, special-occasion things. Collectors Weekly: How were designs imprinted on early Southwest Native American jewelry? Bahti: Generally with stamp work. You see a little bit of hand-engraving. Rock engraving, actually, would be the better description. You see a small amount of that, but most pieces are hand-stamped. Some designs are made with a file and chisel, in which you chisel a line and then dress it to the depth you want with the file. During the first part of the 20th century, everybody was using exactly the same processes. As more visitors came out and there were more people in the business trying to offer unique products that you couldn’t find everywhere, it helped give rise to individual tribal styles as well as encouraging some degree of individual experimentation. And that really started to take root in the ’30s. As with all artists, the jewelers responded to the market. A Zuni might make a certain type of product that he knows he can sell easily at the pueblos or among the Navajos. The Navajos, if they see the market change, will adopt this design or style to suit what the market is looking for, whether it’s Indian or non-Indian. There are, for example, at least two Navajo families I know of that make concha belts, what they call clusters, with a lot of the small turquoise nuggets on them. Some are silver, some are nickel, and all of them are set with imitation turquoise. Their primary market is other Navajos who don’t want to spend that much money on a concha belt. The Anglo market isn’t their target market. The overall market is actually composed of lots of smaller markets, and the artists respond to those or find the one that they work best in. Collectors Weekly: Throughout history, was it common for families to make particular types of jewelry? Navajo silversmith Michael Roanhorse created these coral dangle earrings. Bahti: Yes, very much so. And if you developed a successful style, it was common to try and keep that within the family and encourage family members to learn it rather than to teach it to non-family members. In fact, at Zuni pueblos, you’ll frequently find new jewelry using designs that were originally created by people who are long since deceased. The jewelry may even have those people’s hallmarks on it even though it was made by their children. Because it was their parents’ design and their parents’ style, their children feel it’s appropriate to keep their hallmark. Collectors Weekly: Who are some of the best-known jewelry families? Bahti: There is a fellow Beeshligaii, whose name gets translated in English as “Slender Maker of Silver.” Good silversmithing and a variety of techniques have descended in that family for almost eight generations now. It embraces probably several hundred silversmiths, but all of those particular smiths trace their roots back to Slender Maker of Silver and are very proud of that. There are, of course, lots of different last names now as people marry in, but there’s a very large extended family that goes back to that early Navajo silversmith. Collectors Weekly: Was it common for pieces to be hallmarked? Bahti: No. I can think of only a couple of early people who hallmarked. It was extremely uncommon. After World War II, under the G.I. Bill, the Hopi Guild and the Navajo Guild were set up. Because they followed a guild model, they encouraged the silversmiths to create their own hallmark, and then these could also be stamped with the guild hallmark. It wasn’t quite as successful among the Navajos as it was among the Hopi, but through the ’50s and ’60s, if an artist signed a piece of jewelry, he or she was usually working for a guild or a workshop. For example, White Hogan encouraged each of its silversmiths to use a hallmark in addition to the shop mark. In the early ’70s, that all changed, almost overnight. Suddenly collectors went from wanting to know which tribe made a particular piece of jewelry to wanting to know the name of particular individual who made the piece. Hundreds of silversmiths who had never used hallmarks before were now beginning to use them. By the end of the ’70s, there were probably several thousand jewelers who used hallmarks. Some of them are identifiable; others were just in use for a short period of time, and we don’t know who the artists were, although we have a record of their mark. There were probably more artists working on their own than working for guilds or shops. For the artists, there were advantages to each approach. If you were a silversmith working for a guild or a shop, you had a steady income pretty much guaranteed. Whereas if you were working on your own, you had to make the jewelry and then you had to go out and find someone to buy it, which took away from your time. The plus side of working on your own was that if you were also raising sheep or had a field, you could take time off whenever you needed to tend to your other jobs. For the majority of silversmiths, their art was a part-time occupation. The choice of how to work also depended on where the artist lived. If an artist was based in Gallup or Albuquerque, for example, they could go to the train station and sell directly. Other times they might save up their crafts and take them to town to try and sell them directly, but in the majority of cases, they sold them to an intermediary. Collectors Weekly: Did the designs on the jewelry hold certain significance? Bahti: Not really. Around the turn of the century, people coming out to the Southwest wanted to buy Indian jewelry but most had never seen it before. They had an idea, though, of what they thought it was supposed to look like, so the traders and silversmiths who wanted to sell to that market had to make their jewelry fit that idea. In many cases, that meant covering it with crossed arrows and horses and mountains and sun symbols and all kinds of things. 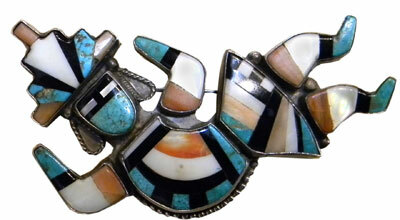 Hopi artist Charles Loloma (1921-1991) is arguably the most famous of all Indian jewelry makers. 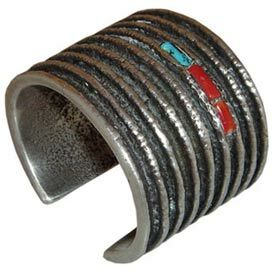 This cast bracelet has turquoise and coral accents. Then, of course, the buyers wanted to know what everything meant, so sellers began creating lists of the designs and saying, “Well, this is a mountain, and it means strength.” Or, “This is a horse, and it means safe journey.” Traders just assigned meanings to them willy-nilly. Individual artists would often use designs that you might find in rugs or pottery or something associated with a ceremony, but they were using it purely as a design motif, not in a representational or symbolic way. An analogy would be if somebody made a bracelet with logos of car companies on it. It doesn’t represent the actual cars, and it’s not a product of the companies, but it just has symbols from those cars on it. So when artists use symbols from other things, people want to ascribe deep meaning to these symbols. It’s all about context. A symbol might represent an abstract design for rain, and to attach a further meaning to it, such as fertility or life, is going too far. Collectors Weekly: How did World War II affect Southwest Native American jewelry? Bahti: During the war, traders were actually able to get an exemption so that they could continue providing silver to the silversmiths. Otherwise, they would have been covered under the rationing acts. But access to materials and tools was reduced or restricted. After the war, the establishment of the G.I. Bill and the Hopi/Navajo guilds had an impact. Also, the Indian people of the Southwest had been exposed to a much larger world—many people chose to participate in that world rather than to go back to the reservation. And then there was the Relocation Act, which encouraged people to leave the reservation, which produced, at best, mixed results. As a result, you see a lot of experimentation and innovation beginning in the ’50s. People, having been exposed to new things and having seen new places, began experimenting more with the design, with the types of things they were making. There was an infusion of new ideas into the work. Collectors Weekly: Who were some of the well-known jewelry makers of the postwar era? Bahti: One of the early ones, in the late ’50s, was Charles Loloma, whom I mentioned earlier. Before him there were the Kee brothers, who worked for White Hogan. Kenneth Begay would be another one; he was also an instructor. They all were quite innovative. Collectors Weekly: When did Native Americans first start using turquoise in their jewelry? Bahti: Turquoise in jewelry goes back a thousand or more years. But setting it in silver only goes back to around 1870 or 1872. Initially a lot of what was set was just hand-cut pieces that people would find, maybe a broken pendant or earring. They’d take a piece of sandstone and grind and shape it and fit it into a bezel or a setting for it. There was hardly any cut turquoise available in the Southwest in the late 1800s. Shortly after that, a trader named Lorenzo Hubble from Hubble Trading Post in Ganado, Arizona, began importing cut turquoise from what was then Persia, now Iran. They had a turquoise mine there that had been operating almost 2,500 years. Hubble began importing Persian turquoise to fill the need. By the early 1900s, cut turquoise was also coming in from newly opened mines primarily in Nevada. So the expectation grew—if you were buying Indian jewelry, it would have turquoise on it. Interestingly, in the 1970s when they had a booming period and the demand for turquoise again outstripped what was available, they once again turned to Iran and began importing Persian turquoise. Collectors Weekly: How can you tell where a certain piece of turquoise might have come from? Bahti: Well, that’s an interesting question. If it has some matrix in it, if it’s a very distinctive stone, you can make an educated guess and be right in those particular narrow circumstances about 80, 90 percent of the time. If there’s not much matrix in it, you’re just guessing. There are people who will say they can tell, but I’ll tell you a very short story that explains why identifying turquoise is a fool’s game to a certain extent unless you’ve bought it at the mine. This inlaid Zuni Rainbow Dancer is probably by Lambert Homer, circa 1950. There’s a mine called the Lone Mountain Mine in Nevada. I had a pendant with a piece of turquoise that looked to me like it might be Lone Mountain. I showed it to a member of the family who had been past owners of the mine for almost 30 years, and that person said, “Absolutely. It’s Lone Mountain turquoise.” I showed it to the man whose family has owned it for the last 20 years and he said with equal conviction, “Absolutely, it’s not Lone Mountain.” So there you have it, the two most knowledgeable people from that one single mine with absolutely irreconcilable opinions on it. That’s why if I identify turquoise, I’ll only give my opinion a 90-percent probability, at the most. I won’t give it 100 percent unless there are unusual circumstances that allow me to really document where it came from. When you get down to it, it really is a matter of whether it’s natural stone. That’s what really counts. Collectors Weekly: Is it fairly simple to tell if it’s natural or not? Bahti: If it’s unset or in its rough state, I think it is. If it’s set or it’s cut and polished and set, it can be very difficult to tell. That’s why I always recommend to people that if they buy something because there’s natural turquoise in it, they ought to have that written down on the receipt so that if it turns out that it’s not, then they’ve got some recourse. Artificial stones are usually made of plastic or resin of some sort. I tell people to beware of terms like stabilized, treated, enhanced, fracture sealed, or treated with inorganic substance. For real stones, depending on its shape, you can have a nugget, or sometimes you can get what we call seafoam, which is a very nuggety and bumpy stone. Some pieces of turquoise have networks of very thin veins, referred to as spiderwebbing. Collectors Weekly: Besides turquoise, what other types of stones have been prominently used in Southwest Native American jewelry? Bahti: Spiny oyster shell provided a good red-orange color for early jewelers to work with until the Spanish introduced them to red coral. Today, shell, turquoise, and coral are the three main materials, besides silver. You do see other stones—opal, lapis—but none are used in a significant way. Collectors Weekly: What is the story behind the Navajo mother-in-law bell pins? Bahti: There’s a Navajo custom that was observed by some clans that a man was supposed to avoid being be near his mother-in-law. In families that adhered to that, the mother-in-law would make some noise or speak so that the son-in-law would know it was time to move out of the way. When these little bell pins were being made, someone got the idea of calling them mother-in-law bells and insisting that mothers-in-law wear them to warn their sons-in-law of their presence. That story goes back to at least the ’20s and persisted well into the ’60s. Here’s a good example of Navajo chisel-work in hammered ingot silver, circa 1920. The turquoise is from Nevada. People are always coming up with stories like that. I’m trying to keep tabs on new ones in case one of them catches hold. About two years ago somebody was selling a Cherokee “power bracelet” on eBay. And I thought, “What the heck is that?” So I clicked on it. It was simply a wide Navajo silver cuff bracelet, but somebody who was part Cherokee said it was a “power bracelet,” and that her grandmother had had one. Within a few weeks, there must have been half a dozen “power bracelets” for sale, Cherokee and Navajo. When people are buying Indian crafts, some are buying it for the artwork, the design, the aesthetic, and the quality of it. Others want a story and some romance behind it. Sometimes they want a combination. And so, some artists will design a piece and add elements to it and a personal narrative that they hope will be of interest to a would-be buyer. Collectors Weekly: Who are some of the contemporary artists creating Southwest Native American jewelry? Bahti: I’ll just give you kind of a cross section, with the caveat that for every name I give you, 20 people will wonder why I didn’t mention them, too. One artist who has been at it the longest is Duane Maktima. He’s a Hopi in Laguna, New Mexico. He’s been working silver for close to 40 years now but always innovating with new materials, designs, and techniques, and so forth. One of the newest innovative artists, who is also from Laguna Pueblo, is Pat Pruitt. He works in everything from surgical and stainless steel to titanium. He inlays with carbon fiber, raw diamonds, and 24-karat gold. Other people to mention include Cody Sanderson, Fritz Casuse, Robert Sorrell, Maria Samora, and Keri Ataumbi. Collectors Weekly: In the early part of last century, was it more common for men or women to make jewelry? Bahti: It was more common for men, definitely, and that’s largely because of the changing roles of men. Most tribes in the Southwest are matriarchal, matrilineal, and matrilocal. Basically children stay with the women, the land stays with the women, all the possessions, the livestock, the fields stay with the women. So when silversmithing came along, it was something the men could do. It was a skill, a craft, and a source of income that was theirs—they could take it with them. Women pretty much had their hands full, and there wasn’t a lot of opportunity for them to find the time to work silver. That said, when you got into the early 1900s, some women silversmiths had started showing up in the pueblos and among the Navajo, but it didn’t really become more commonplace until well into the ’50s and ’60s. Today, some of the best silversmiths are women. Collectors Weekly: What inspired you to write about Native American jewelry? Bahti: One of my first books was “Collecting Southwestern Native American Jewelry,” a small paperback published by David McKay 20-some-odd years ago. That came about because of a friend of mine, Fred Dockstader, who was then the director of the Heye Foundation in Washington, D.C.—it is now called the Museum of American Indian. He was asked to write it, but because he didn’t have the time to do it, he recommended me. That’s frankly how it came about. This coral, turquoise, jet, and serpentine cardinal pin was made in the late 1960s or early 1970s by the late Zuni artist Porfilio Sheyka. Every once in a while someone will say, “I was referred to you because you’re an expert,” and I absolutely reject that title. I am not an expert. I’ve only been at this for about 40 years, so I’m still learning. One of the things I’ve learned is that if you think you’re an expert or think you know almost everything about a subject, then you’re going to be blind to the opportunity to learn more. I did a book called “Silver + Stone” about two years ago, in which I interviewed about 50 different jewelry artists. Even when we were talking about the most basic techniques, I learned about other ways that things were done at one time or another. For example, I talked to a very elderly man, who, as a young child, watched one of the very first Indian silversmiths work. Because he was a silversmith all his life, he was able to describe the workshop, the techniques, and what was produced. It was like looking through a window back into the early 1930s. It was just amazing. Whenever I interview an artist or a trader or a turquoise cutter about something that I’m not familiar with, I try to independently verify the information. And because I have an academic background, I have a habit of cross-checking my information. That always proves to be very interesting part of the process. Collectors Weekly: Do most collectors collect by artists or pieces? Bahti: Well, there are periods when it’s very difficult to know who the individual artists were, and so people tend to collect by era. If a piece can be reliably attributed to one of the few identifiable artists from a period, their work will command a premium. The problem, of course, is a reliable provenance. People try to divide those eras up into very neat, discrete periods of time. The problem is it’s not unusual for a silversmith to work silver for 40, 50, 60 years. A silversmith in the 1930s could have made the same types of things he made in the early 1880s, often using the same techniques. So dating is more art than science, shall we say. There are general trends that would tend to put one piece earlier or later than another, but it’s a contentious area because people selling older work always want it to be as old as possible to increase its value. Each collector tends to carve out an area that’s of particular interest to him. Some focus on the early railroad era, the early stuff that’s covered with lots of different stamps and designs and decorations and so forth. Some like to collect the earliest plain silver pieces they can find. Some people focus on a particular type of turquoise. And some will even collect primarily, if not exclusively, the work of a single artist or a single artist family. So there are a lot of different approaches to it. I know one fellow who collects nothing but plain silver guard bracelets, and it’s just amazing the diversity that he’s found in something as simple as a guard bracelet. He must have several hundred, and none of them are duplicates. Collectors Weekly: What makes a piece of jewelry rare? Bahti: A number of factors. It could be the stone in a piece. It could be a combination of the style and the artist. It can also be the technique or the era. Sometimes a piece can be made from the same base material, but how it’s made can affect its desirability. For example, ingot silver can be used to make jewelry, but there are two types. There’s rolled ingot, where you take a slug of silver and you put it through a rolling mill successive times to flatten it out. This turquoise heishe necklace is by Joe and Mary Calabaza. Then there’s hammered ingot. Now, a hammered ingot silver bracelet would be regarded as very collectible. It’s a great deal more work and far fewer were made—there aren’t many people who could make them today if they wanted to. It takes a tremendous amount of work to replicate a surface that you can get in an instant from a piece of sheet silver. So that’s an example of something that would make a piece a rarity, its technique. Collectors Weekly: What advice do you have for someone who is thinking about starting a collection of Native American jewelry? Bahti: I would suggest that they go to a place like Santa Fe or Scottsdale or Tucson or to their library, and keep their wallets and checkbooks at home. Just immerse yourself in the subject, because whether with jewelry or anything else, what catches your eye in the beginning is not necessarily what catches your eye after you’ve been looking at it for a while. So you want to expose yourself to as much of it as you can. A great place to go are some of the new shows and exhibitions sponsored by museums where you can actually talk to the artists, which is a really valuable experience. Once you get past that initial sensory overload, then you’ll be in a better position to judge whether the things you are thinking of purchasing will be a source of long-lasting pleasure. Hi,Mark! Great article! You are so very right—the more one sudies old Indian jewelry, the more one wants to know! I do wish you would let me know if you get anything in by the “old ones”. I. E.–Wallace era silversmiths. Can you believe it? At 80 I am more enraptured by old Indian jewelry than ever! I hope you and yours are well! Great interview. I really enjoyed hearing about your experiences and your opinions. And I didn’t know the business got it’s start at Ghost Ranch. Thank you for sharing your love of Native art. Mr Gragg: the Mother of Pearl necklace is most likely from the 1970s when a number of such pieces were made. So far I have never heard or seen of one made earlier using MOP. As for the Roanhorse piece, I would have to see a photo of the stones and the hallmark in order to tell you much about it. Excellent article, Mark. Love reading what inspires others about Indian jewelry. My brother has a coral and turquoise inlay ring with feathers on each side with same markings as Tom Cappella’s ring. It also has a CJ entwined stamped on it. It is also old – he has had for abt 30+ years. Any info on this artist would be appreciated. In the 1970’s, my Uncle, an antique dealer, gave me a very large (size-wise and weight-wise), man’s ring with a nice turquoise and equally nice piece of coral inlaid in heavy silver. The artisan hand-scratched his “signature” on the underside of the ring. The most identifiable part of the engraving is a stylized curved L with what looks like a stylized arrowhead shape in the middle with the point downward with another like “L” at the end – like an arrowhead sandwich with the curved backward leaning L’s being the bread. The “Sandwich” slants upward with what looks like beneath an arrow with a little check mark at the point of the arrow. The arrow points/slants upward in the same direction. At the pointless end of the arrow is what I feel is a simple stylized bird of two curved lines almost looking like an upside-down, thin scimitar sword with a curved blade and curved handle. Right below the upward pointing bird/sword just below the wing/handle and to the right is what just looks like a simple small arc about the same size and parallel to the wing/handle. I know that sounds like a Rube Goldberg type of description but it is kind of accurate. If this does not help at all, I have a friend visiting in September and maybe she could take a picture of it and email it to you. I am very curious to find out who the craftsperson is. I could never wear it, because it was way too big for me. Thanks for any help. Love and Peace, Jesse Bedivere. Thank you for the article. I am the grandson of John Bonnell, son of Jon Bonnell, owners of The White Hogan. We are proud to be part of modern Native American jewelry history. My father and grandfather always respected the artists talents and worked hard to foster and encourage their individual careers while working a bench at the shop. 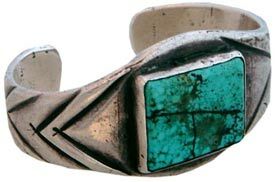 I live in Santa Fe and carry on the family tradition of turquoise cutting and silversmithing as taught to me. We moved to Tucson in 1962 and loved to visit your parents’ place on Speedway. When we moved from apartment into a house, we bought something there–one of your dad’s pieces– that I have always called a wood block print. It is called “Indian corn” and shows four ears of corn, using three colors–red, yellow, and blue. It used to hang over our fireplace and is still a very cherished item–both because of its art and because it reminds us of wonderful years in Arizona. Today an artist friend of mine showed me something she had just recently done–three ears of corn, using red, yellow, and blue. I remarked that it looked like my Tom Bahti woodblock. Later she came to my house to see my print, and said she thought it might be silk screen. But she was very impressed with the work and was happy to know about the Bahti gallery. She’s a lover of all things western and visits Ghost Ranch to paint most summers. I don’t suppose you remember the work I’m talking about. If you do, could you tell me whether it was woodblock, silk screen, or something else? Also, can you tell us the origin of the name Bahti? I purchased a sterling silver bracelet with opal settings with the marking of Marie dayea who is deceased. What history is known, what is her marking and where can you find a collection of her pieces on a secure site other than eBay? 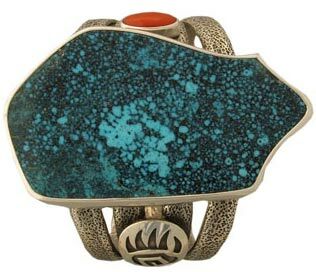 I bid on & won this Navajo turquoise & silver cuff bracelet, with the name “Johnnie Mace” on the back. It has 3 pieces of rough (raw) turquoise & 6 leaves on an oversized cuff bracelet. I have the guarantee of the auction house that it is true vintage Navajo. Would appreciate any info that you may have on this artist or the bracelet itself. Thank you in advance for your assistance. I’m researching information about Zuni or other’s use of Plastic in place of the traditional stones used in jewelry making. I remember seeing photos and reading about them during the 1970’s. I believe they were made during the Great Depression or WW2. Red Coral was substituted with Red plastic tooth brush handles, White plastic forks, Black vinyl record pieces, etc. for the different stones and scrap turquoise was used to make beautiful pieces. Any help here is much appreciated as I can’t find any information on this other than my sketchy memory. I have a navajo & a zuni bracelet they both have letters engraved with an electric engraver I think they are shop letters . I would to know if they can tell who made them & where they were made & what year . thank you . TAMM KISZ: unless it is marked M DAYEA it is by another silversmith the initials MD as she never worked with opal. The only (remote) possibility is that some removed the coral or turquoise and substituted opal. CAROL NORTON: there are four Mace brothers that I know of – all silversmiths: Cecil, Harry, Joseph and Ted. Johnny may be a son of one of them. MARY HELEN GARCIA: a couple of possible silversmiths who use the mark BP so I can’t say which. JAY SCHWARTZ – the necklace and earrings that I think you are referring to were mostly made at Santo Domingo Pueblo in the 1940s, petering out in the 1950s. Battery casing was used for the backing, gypsum from a nearby mine for the beads and then platsic headbans, spoon, knives, dishes for red and white (and occasionally other colors, along with real turquoise and airplane glue for the adhesive. The Wheelwright Museum had an exhibit of them several years ago. There was a small catalog or brochure for it. B.BEESON: 95 times out of 100 letters scratched in were the trader’s cost code.